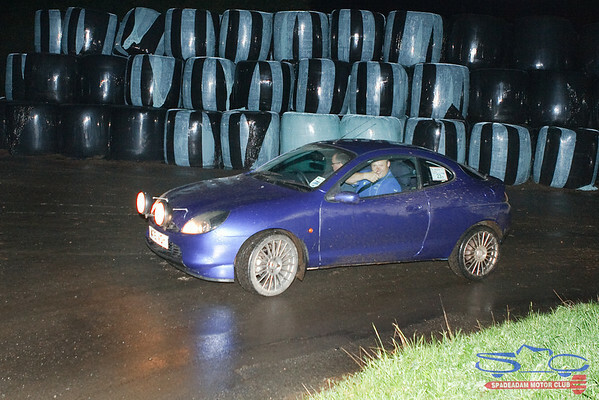 12 Cars are one of the cheapest ways of getting onto motorsport and a good stepping stone to learn most of important skills needed for other sports like rallying. 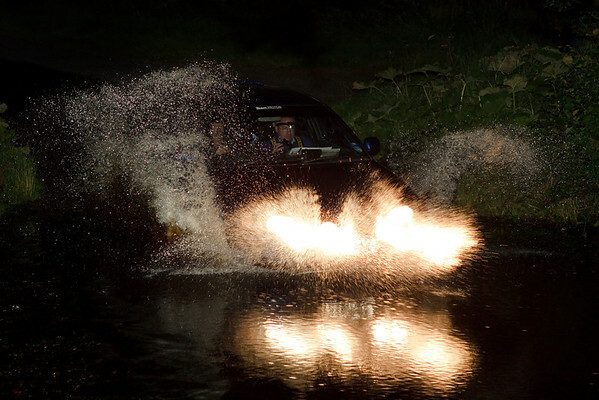 12 Car rallies are normally on a weeknight in the winter so that dark nights make driving country road safer. Events are normally around 60 miles. The organiser will provide route instructions at selected points where times are also recorded known as time controls. Timing is at 30mph average between each time control, you then need to plot the instructions onto a map then drive the route within time. The longer it takes to plot the route the quicker you need to drive so as you gain experience you try to plot as the driver is slowly driving. Along the route the organiser will have placed marker boards (number plates normally) you need to write these down its evidence you went the correct route. 12 Cars & navigational rallies are an excellent “first step” into the world of rallying, whether you want to be a driver or co-driver. After the obvious of a car with both a driver & a navigator. The most important is the Ordnance Survey map for the correct area, the organiser will say which area map and sometimes a certain edition (new roads or features may not be on older maps). Map, Pencil, Rubber, Potti light & roamer. You will also need a soft leaded pencil easiest to mark the map 3b is a good start along with an eraser and sharpener. A board to lean the map onto when marking and also easier for following the route and also something to clip the time-card to so the marshal can record the time quicker would help. Next come the more specialist items. A Roamer (Pictured below) these are available to buy (£5.00 from the club) at most events, these ‘Basic Roamer’ ones have a lot of helpful bits to them and come with an instruction leaflet explaining how to use them. They help with Grid references, compass directions, angles, radius circles. 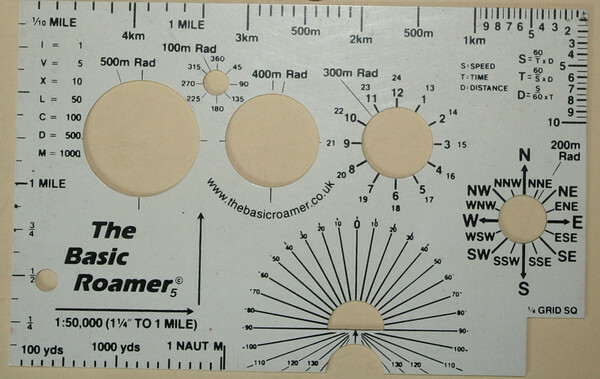 A ‘Basic Roamer’ has plenty of info to help a navigator when plotting the route. 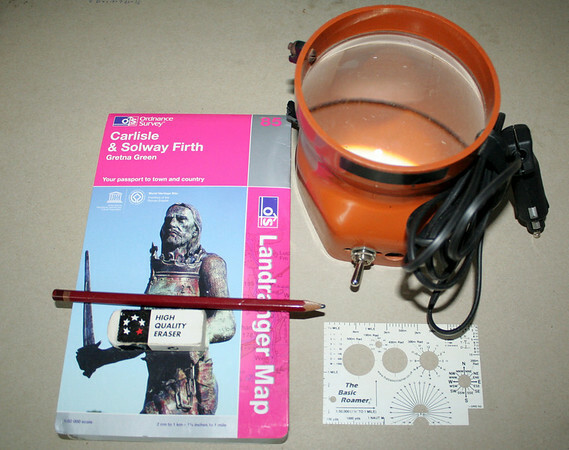 The next item is a map light (also known as a ‘potti light’) This is a light and also magnifying glass which enlarges the map and makes reading the road on the map easier. Contact Spadeadam MC to find out when the next event is and who is organising it. We also do training evenings were you get to learn the different types of route instructions without going anywhere and experts are usually on hand to help. If there is no training night scheduled ask for a sample of a previous event, you can then work away at it and ask for advice if you struggle plotting the routes.